IMPORTANT: The device must be connected with an active and configured connection of the phone arrangement / NTBA. Open the Menue „Physical Interfaces“ and select „ISDN-Ports“. Depend on the device you can see „BRI“ ans/or „PRI“-Ports. Normally the ports on "automatic" recognition are put. 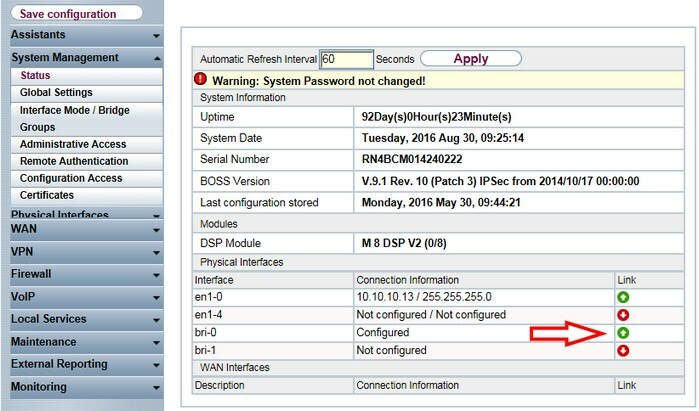 If the device was restarted after the connection of the ISDN management and the connection was recognised, this is already indicated you under "ISDN Switch type". In this case you can ignorethe next step. If the connection was not recognised (e. g. because as a protocol Q-SIG“ is furnished), you must configure the connection manualy. Select Symbol beside the desired connection. Unmark the option "Autoconfiguration on Bootup"
If the connection with PBX use the Protokoll Q-SIG. If you select „Point-to-Point, a new line " P-P Base Number" is indicated. Please don't type in anything ! Change to MSN Configuration – also if the connection recognised be reboot. Normally there is no entry. Click on "New" to provide an entry. The following configuration are independent of the connection. You need to configure always. The adjustment in„MSN-Recognition“ depents of the connection type. Save the configuration with "OK"
At the end select "save Configuration" on the left side about the menu . Recommendation – but not compelling necessarily: Now they should restart the device!